In the recent times, the implementation of neuromarketing in the fields of telecommunication, advertising, and media have gained significant momentum. A large number of big companies are making heavy investment on the study of various subjects that are related to neuromarketing in a bid to understand their response to their advertising campaigns and media, which consequently, is impacting the world market for neuromarketing solutions remarkably across the globe. The need to study the consumer behavior is also adding to the substantial growth of the market. The world neuromarketing solutions market exhibits a landscape that is highly consolidated competitive. Tobii Technology, EB Neuro S.p.A., LC Technologies, ISCAN Inc., Cadwell Industries Inc., SensoMotoric Instruments, Compumedics Ltd., iMotions, and SR Research are some of the leading players that are operating in this market. In accordance with the research report on the world market for neuromarketing solutions treatment by Transparency Market Research (TMR), it has been anticipated that strong growth would prevail in the said market. The market, which stood at around US$ 0.94 bn in the year 2016, is quite likely to expand at a rate of 10.20% CAGR between 2017 and 2025 and reach a market valuation of around US$ 2.20 bn by the end of the year 2025. The world market for Neuromarketing Solutions treatment has been regionally segmented into the geographies of South America, North America, Asia Pacific, Middle East and Africa, and Europe. 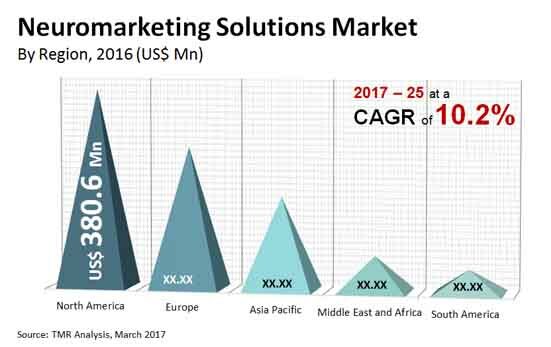 Amongst these, the region of North America emerged as the leading contributor towards the global market for neuromarketing solutions in the year 2016. Amongst other regional segments, the region of Asia Pacific is forecasted to experience a huge rise in the global market for neuromarketing solutions in the near future and China is forecasted to lead the Asia Pacific market for neuromarketing solutions. The market in the Middle East and Africa is also forecasted to witness a sluggish rise while the growth of South America market will be limited by the regulatory hurdles in the future years. One of the crucial factors that spell growth for this market is the fact that neuromarketing solutions assist process consumer data in a marketing environment in an extremely effective manner due to the usage of neuroscience techniques. The growing applications of neuromarketing solutions across a number of industries, majorly as the awareness pertaining to the immense potential benefits of these techniques is growing at a promising pace, is also doing well for the market. The market is also massively benefited from the growth in the investment across the field of advertisement in the last few years.